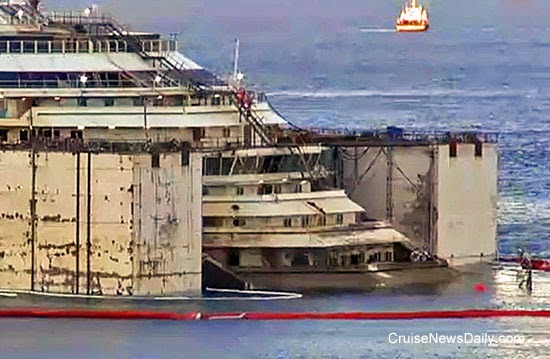 At 11am local time (5am Eastern time in the US) on Saturday morning, the operations center reports that Costa Concordia has risen so that Deck 5 is completely above the water, and Deck 4 is still approximately two meters under water. The wreck is currently floating an average of 6 meters above the underwater platform upon which it was resting. The plan calls for Deck 3 to be out of the water when the transport to Genoa begins next week. Operations to control the ballast are currently being performed, and the operations center reports the wreck is stable. Update: As of Saturday evening, Costa Concordia's bow is beginning to emerge as the ship continues to rise from under the water. Salvage operations control announced today that towing from Giglio will now begin on Tuesday morning. By early Saturday Deck 5 was fully out of the water. On Saturday, Deck 4 and the bow began to emerge. May I have the envelope, please? No envelope? It’s a tweet! The award goes to Norwegian Cruise Line for an upcoming promotion they are running in New York, Miami and Houston. 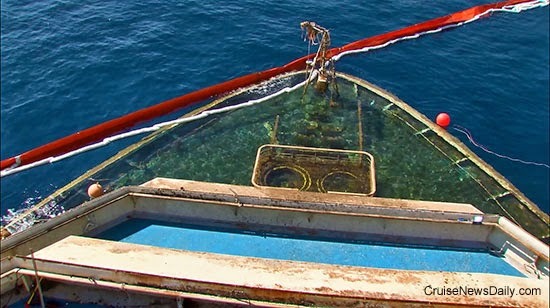 Work to secure the starboard sponsons on the wreck of Costa Concordia is clearly going more slowly than anticipated. The original time line called for that phase to be completed Wednesday, but it is still continuing and will continue overnight Friday. Carnival Cruise Lines went through some dark days a couple of years ago. It seems like the stars just aligned so that they went from one PR disaster to another. Their image was at least bruised, if not more. Then they set their minds to improving it with a number of initiatives and new passenger programs. Guess what? It worked. YouGov’s BrandIndex has ranked Carnival Cruise Lines the most-improved U.S. brand in consumer perception, or “buzz,” in its mid-year 2014 Buzz Rankings Report. CND subscribers also read about why you should stock up on mosquito repellant if you're going to San Juan ... a woman missing from Costa Victoria ... and before there was QM2 and QE2. 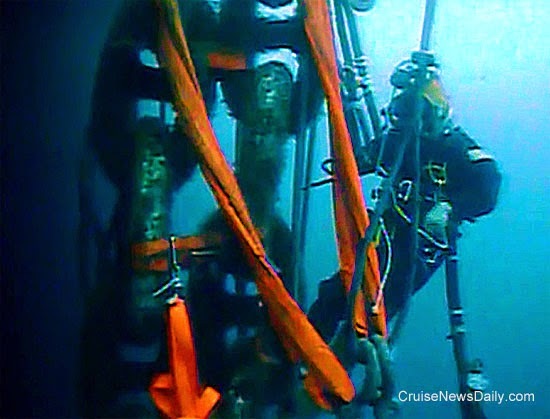 Divers continued to work to secure the starboard sponsons on the wreck of Costa Concordia through Thursday night and all day Friday. Operations will continue over Friday night. The work has been completed on two of the three remaining starboard sponsons. As of tonight, those two have been lowered into their final positions, raising the wreck about one additional meter, and Deck 5 is almost out of the water. One chain and three cables remain to be connected to the final starboard sponson, and work will continue through Friday night. 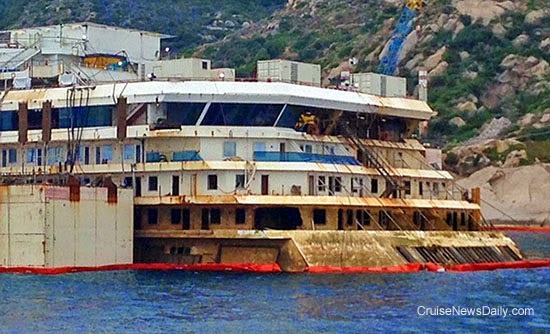 More of Costa Concordia emerged on Friday, and Deck 5 is now almost out of the water. Sister ships can be funny things. Take Queen Mary and Queen Elizabeth – two of the most famous ships ever to ply the North Atlantic. Both similar in size, style and speed and both heralded by Churchill for shortening the Second World War by a year thanks to the role they played. But one, Queen Mary, was always the more popular (with both passengers and crew) and no-one can quite say why! Queen Mary just had "something" is a common response from those who knew both ships despite her younger sister being slightly more modern. One reason I'd suggest Queen Mary being the more loved of the two is she carried the hopes of a nation for a brighter future and was hailed as a symbol of the end of the Great Depression. It was purely by circumstance that the company produced a ship which more graphically shared the country’s triumphs and tribulations, and which was more loved by people who had never even seen her, let alone set foot on her, than any which had gone before. Work on Number 534 began at the Clydebank yard of John Brown and Co late in 1930. She was being built at an estimated cost of £6.5 million out of Cunard revenue, without the benefit of any state subsidy. Almost alone at the time Cunard operated on the North Atlantic as a commercial concern; every other major line was subsidized to a significant degree by its national government, but Cunard was expected not only to compete but to ensure Britain remained dominant on the North Atlantic without a penny of state aid. The company did so until the Depression cut revenues of £9 million in 1928 to under £4 million in 1931, and despite Cunard staff on shore and at sea taking a pay cut, work on the construction of Queen Mary stopped just before Christmas 1931. Immediately 3,640 men in Clydebank – a town where half the wages came from Queen Mary – were thrown out of work. But the ripples were felt by 10,000 ancillary workers further away. They were felt in Stoke-on-Trent, busy working on 200000 pieces of crockery; in Sheffield, where 100,000 items of cutlery were being crafted; in Walsall, which was producing 400 tons of tubes; in Rugby, manufacturing seven turbo-generators; in Liverpool, producing 2,500 square feet of toughened glass; in Millwall, casting four 20-foot propellers; in Darlington, forging the 190-ton stern frame; in Belfast, working on the 5.5 ton gear wheels; in Halifax, weaving 10 miles of blankets; in St Albans, producing 600 clocks; and in other towns up and down the land making curtains, carpets, anchor chains and furniture. All of them stopped. The rusting skeleton of Queen Mary, with 80 per cent of the hull rivets in place and £1.5 million already spent, was symbolic of the financial catastrophe which hit both Britain and America. It was so graphic a symbol of which the general population was so conscious, that members of the public sent thousands of unsolicited donations of money to Cunard in an effort to get the work restarted. The Government was implored to lend Cunard the money to complete the ship and get so many back to work – but the Government steadfastly refused until 1934 when, in a complex deal which required Cunard to take over the running of White Star’s ailing transatlantic fleet, Neville Chamberlain, then the Chancellor of the Exchequer, agreed to lend Cunard sufficient to complete Queen Mary and build her sister, Queen Elizabeth. And so, on 3 April 1934, the John Brown workforce, led by the Dalmuir Pipe Band, returned to work and began by removing 130 tons of rust and dozens of nesting crows. Just five months later Queen Mary, wife of King George V, became the first monarch to launch a merchant ship, a job which she accomplished with a bottle of Australian wine rather than the traditional French champagne. As she said the words, broadcast over the radio, “I name this ship Queen Mary; may God bless her and all who sail in her” millions of the King’s subjects heard his wife’s voice for the very first time. Two hundred thousand spectators watched the launch – and many, on the opposite bank of the dredged and widened Clyde, got wet up the knees as an eight foot wave surged across the river when the enormous hull entered the water. A good story – but not true. Cunard had already decided that since the White Star and Cunard transatlantic fleets had been combined under the new banner Cunard White Star, neither the traditional White Star “ic” ending or the Cunard “ia” ending was appropriate. The first ship of the new company needed to break with tradition – and Queen Mary it was intended to be. 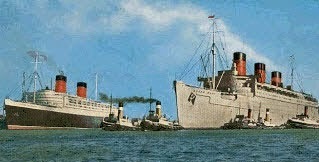 The maiden voyage began in Southampton on 27 May 1936, and Queen Mary left to the sounds of bands and ecstatic crowds. On board were the famous bandleader, Henry Hall, scheduled to give a series of live radio broadcasts during the crossing; the virtuoso harmonica player, Larry Adler; and a well-known singer of the time, Frances Day, who performed a song written specially for Queen Mary by Henry Hall, “Somewhere at Sea.” And, much as she may have liked being at sea, Miss Day did not trust the ship’s eggs to be fresh by the end of the voyage so she took along her own chickens. Queen Elizabeth never had the glorious entry into service planned for her in 1940 - as discussed on a previous article – and was pressed straight into military service. When her time came in 1946 a war-weary Britain had other things on its mind. After the War Cunard's two sisters would rule the Atlantic for the next 20 years. Queen Elizabeth was the largest passenger ship ever built (and would remain so until 1996) and Queen Mary was the fastest (until 1952). Two great ships indeed only really differing in the affection people had for Queen Mary over Queen Elizabeth. And while I never saw either, Queen Elizabeth is my girl! One thing most cruisers always like is going places they haven’t been before. That alone could make Crystal Cruises’ new Arctic program a sellout, because it has the ultimate “you haven’t been there before” locales, but this cruise that was announced today has so many things going for it, that it will probably sell out right away - two years before it departs. Crystal seems to have really tapped into what their customers will want. Adverse weather and sea conditions have delayed the final steps necessary to refloat Costa Concordia. Although work under the ship is able to continue, it has been slowed considerably from the planned schedule. The salvage master issued a statement at noon (local time on Giglio, 6am Eastern time in the US) saying strong winds were intermittently delaying work on the final attachment of the starboard sponsons to Costa Concordia. Despite this, they are continuing to work as they can. At that point there were still two chains and four cables to be connected to three of the starboard sponsons (S4, S5, S18). The chain to sponson S12 had been connected, and they were expecting work securing that sponson to be completed within a few hours. At 8:30pm local time, the salvage master was reporting that work on sponson S12 was complete and it was being lowered into its final position. There were still two chains and four cables to be connected to starboard sponsons S4, S5 and S18. Work will continue as weather conditions permit. Titan Micoperi now admits weather and sea conditions have impacted the schedule by delaying the necessary attachment work. The refloat has obviously been delayed, and will now possibly begin on Friday. Technicians are still working toward a departure of the ship from Giglio on Monday, July 21, but they admit that could now slip to Tuesday, July 22. Photo courtesy of Costa Crocerie. All rights reserved. May not be copied or used without permission. The work under Costa Concordia has continued on Wednesday in preparation for the “main event,” still planned for Thursday. Staterooms on two of Star Clippers’ ships recently got makeovers, and additional refurbishment work was done aboard Star Clipper as it crossed the Atlantic at the beginning of the Mediterranean season. CND subscribers also read about Norwegian following suit ... and Carnival declaring a dividend. 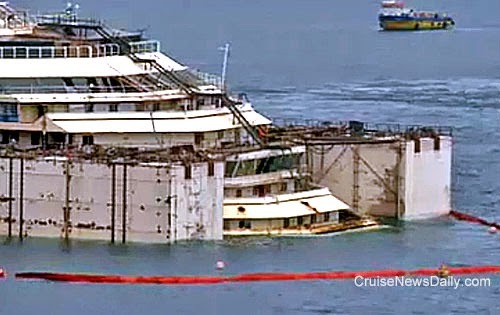 Costa Concordia's salvage master reports that as of about 11am local time in Italy (5am Eastern time in the US), there were still three chains and five steel cables to be connected to sponsons on the starboard side of the wreck. Those will run under the ship to the port side to secure the starboard sponsons in place. He is also reporting that readings show the bow is floating up two meters (above the level at which is was resting before the refloat) and the stern four meters. 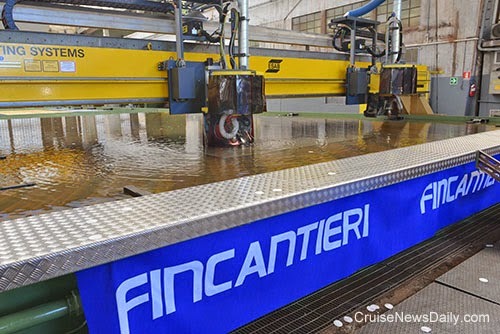 Fincantieri cut the first steel today at their Sestri Ponenti yard near Genoa for Prestige Cruise Holdings’ recent order for their Regent Seven Seas brand. Today and tomorrow are all about getting Costa Concordia ready to float up the rest of the way and then be safely towed to Genoa. This isn’t just about making checks and minor adjustments (although they are), this is about doing things that couldn’t be done while the ship was resting on the underwater platform which are necessary to make the ship float up the rest of the way. Most of it involves final positioning of the sponsons, which actually make the ship float. Because today is all about the sponsons, we thought this would be a good time to get a little more detail and understand them better. Tuesday and Wednesday may not seem to be dramatic days since the ship isn't moving, but there are two important projects being completed so technicians can finish refloating the ship, scheduled for Thursday. The project was more fully explained in Tuesday's edition of Cruise News Daily. 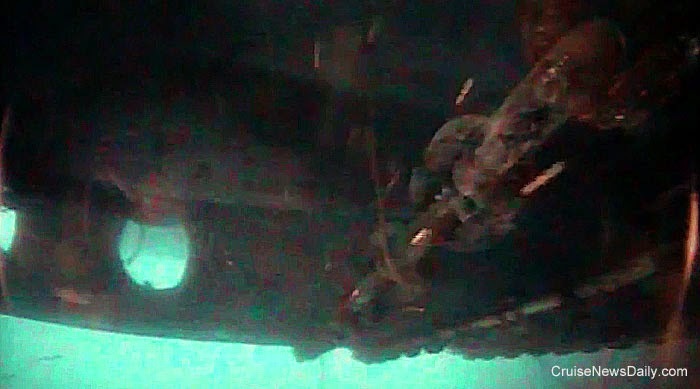 This photo, from a dive Monday, shows one of the chains running under the ship that secures one of the starboard sponsons. This illustration shows Costa Concordia as it was resting against the hill and on the underwater platform. This illustration shows the ship floated up slightly and pulled away from the hill. Note the starboard sponsons could now be fully lowered to their proper positions. Graphics courtesy of Costa Crocerie. All rights reserved. May not be copied or used without permission. MIAMI (July 15, 2014) – Through a variety of innovative fundraising activities, Carnival Cruise Lines has raised more than $5 million for St. Jude Children’s Research Hospital for the hospital’s many lifesaving pediatric cancer research and treatment programs. In addition to its Care to Play: Carnival for St. Jude Kids shipboard fundraising campaign, the cruise line also serves as the Official Celebration Partner for St. Jude, supporting birthday parties, proms and other celebratory events at the Memphis, Tennessee, hospital. Carnival Cruise Lines is on track to raise $8 million by 2017 through a range of engaging activities, both on board and ashore. These include Groove for St. Jude, a fun dance activity where guests make a $10 donation and receive a Care to Play T-shirt and wristband, and the Beary Cuddly program where kids can build their own stuffed animal with optional accessories such as medical scrubs, all available for purchase with proceeds benefiting St. Jude. Planned for this year is a special bingo game with a portion of each card benefiting St. Jude, as well as a water slide activity with a $1 donation for each ride during a specified time on board. And when guests purchase a designated bakery item from the line’s on-board shops or prior to their cruise on carnival.com, Carnival donates a portion of each item sold to St. Jude. Carnival’s Official Celebration Partner activities include supplying entertainment at the annual St. Jude Teen Formal and hosting an annual Day of Play with music, food, dancing, giveaways and more. Earlier this year, in conjunction with National Dance Day, Carnival provided kids and their parents an afternoon of fun at the first-ever in-hospital Groove for St. Jude, modeled after the popular shipboard activity. Birthdays are also celebrated at the hospital with a special gift from Carnival complementing traditional festivities. Carnival has also revamped the St. Jud portal within its web site (www.carnival.com/stjude) which includes information on the partnership and a chart reflecting progress toward the company’s $8-million fundraising goal. Carnival, a unit of Carnival Corporation & plc (NYSE/LSE: CCL; NYSE: CUK), is "The World's Most Popular Cruise Line®" with 24 ships operating three- to 23-day voyages to The Bahamas, Caribbean, Mexican Riviera, Alaska, Hawaii, Canada, New England, Bermuda. Australia, New Zealand, the Pacific Islands and Tahiti. The company’s 25th ship, the 135,000-ton Carnival Vista, is scheduled to enter service in 2016. This morning, Norwegian Cruise Line said they ordered two additional Breakaway Plus ships from Meyer Werft. The 164,600-ton ships will be delivered in the second quarter of 2018 and the fourth quarter of 2019. 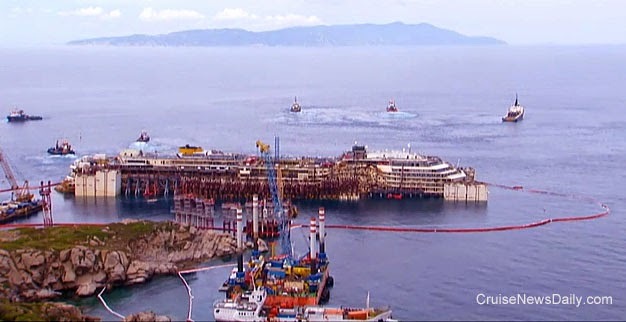 This was a milestone day in the removal of the wreck of Costa Concordia from Giglio Island. Everything went as planned, and by the end of the day the ship was again floating and secure in place about thirty meters east of where it had been sitting on the underwater platform. 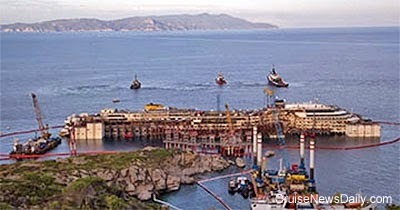 Operations began as scheduled this morning at Giglio Island to refloat Costa Concordia. As of 8:30am local time (2:30am Eastern time in the US), the first step was well underway. In that phase the wreck was being lightened, and out of 30,000 tons of weight to be offloaded, only 1,000 remained. Once that weight was reached, the operation to lift the ship off the platform could begin. It will begin with the stern first. Update: At 5:30am (Eastern time) the operations manager was reporting that the ship was detached from the platform and the sponsons were keeping it afloat. At 6:00am, the ship had raised approximately one meter, with one more meter to go before towing of the ship will begin to position 30 meters east. Technicians have begun to tighten the chains on sponson S14 as planned to keep the ship in place. Update: At 10:35am (Eastern time) the operations manager reports that towing 30 meters east is in progress. All eyes are on the waterline as the ship reaches close to 2 meters out of the water at about 8am Eastern time. Once the wreck was floated up about 2 meters, it was towed very slowly 30 meters east. In this photo of the stern, the waterline can clearly be seen where the ship has been sitting two meters lower in the water. Update 2:30pm Eastern Time: Costa Concordia is now floating about 2.2 meters above the underwater platform upon which it has been resting, and the towing is complete. It has been moved about 30 meters east and has been secured there for the night. Next will come two days of securing and positioning of the sponsons before the wreck is refloated up farther. All rights reserved. Photos may not be copied or used without permission. 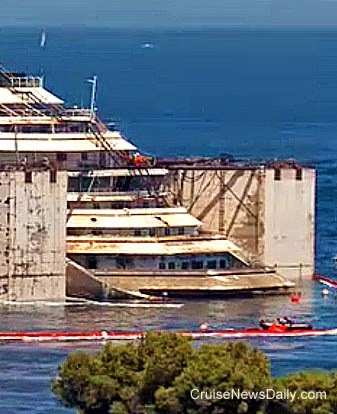 Costa Concordia as it looked on Sunday ready to be refloated. 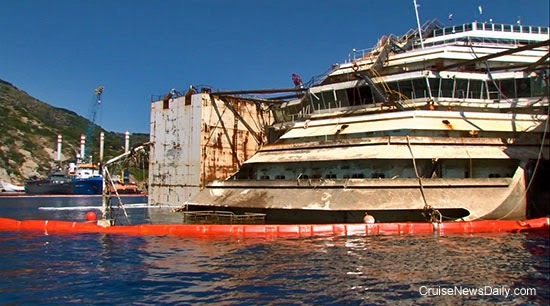 Titan Micoperi (the consortium Carnival/Costa has employed to remove the Costa Concordia wreck) has received final approval from the Italian government to refloat the Costa Concordia wreck beginning Monday morning (July 14) at 6:00am local time (12:00 midnight Eastern time in the US). During the first phase on Monday, the ship will be floated up just about two meters and towed about thirty meters east. It will then be moored with two anchors aft and six steel cables on the ship's starboard side. It will be kept in position by two tugs on the ship's port (offshore) side and one at the ship's bow. Monday' operation is expected to take six to eight hours. Illustration of how Costa Concordia should look at the end of Monday's operation.